Whether you're new to using log splitters or can split behind your back while blindfolded, safety should always come first. So while you may think you can split 20" beach wood logs while hanging upside down over a pool of sharks, just don't. Using your splitter safely is the best way to show off your skills and save money on unnecessary medical expenses. Refresh your memory and know what to watch out for, what to avoid, and how to split logs without losing your hands. Unless you're operating an electric log splitter, you'll be dealing with high decibel levels of sound. 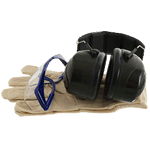 Wearing hearing protectors is a good way to protect your hearing from being damaged by excessive noise exposure. Because debris may fly as the logs crack apart, be sure to protect your eyes with some quality eye protection. 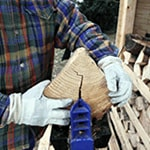 When you split logs, pieces of wood may fall from the splitter. Protect your feet and legs by wearing long pants and steel-toed boots. The last thing you want is a 50+ lb chunk of wood crushing your toes. Lastly, what do you use the most when splitting logs? Your hands. Wear some heavy duty work gloves. While we all know that calloused hands are the trademark of a hard-working man, we still advise against bare-knuckling a 150-pound round of walnut. Protect those assets! Kids are curious, and they always want to do what you do. Keep them away from machinery though. A log splitter is definitely not a toy, it's a tool. 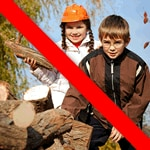 Children should never be allowed around your log splitter while in use, and should never be allowed to operate it, even with supervision. If your hands are an asset worth protecting, your children should be an even greater asset. Make sure they know to stay away. A major part of safely operating your log splitter is knowing how it's meant to be operated. We know reading instructions isn't among your favorite things to do, but trial-and-error isn't the safest way to learn how to use powerful machinery. Settle into your most comfortable chair and read through how to use it. You'll feel much more confident when you first start it up. Some log splitters today feature lifts, height adjustments, or are easily portable. Find a safe way to reduce the range of motion required when lifting rounds. Continuously lifting 150 pound rounds from the ground to the bed of your truck may lead to some crippling pain. If you're planning on hauling that firewood back to the house, take it easy and consider investing in a log lifter or a horizontal/vertical splitter for larger rounds. When operating your log splitter, maintain a clear perimeter of at least 3 feet around the entire unit to avoid injury and allow proper ventilation. Do not operate in a dense crowd of people, no matter how popular you are, and don't allow anyone else to touch the machine while it's in use. Be aware of everyone else in your area during operation so they don't get struck by a falling log or flying debris. No two logs are exactly the same. Some will have knots, some will crack at an angle, and some may even turn sideways. 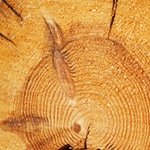 Be aware of logs that aren't splitting straight, and don't be afraid to stop and readjust before continuing. Always split with the grain, and expect the unexpected. Gnarly logs can end up splitting in very unusual ways, and a good sense of awareness can prevent these situations from becoming a problem. While it's obvious you should never operate heavy machinery while intoxicated, this doesn't only mean alcohol. Decongestants and prescription medications can cause you to lose focus or become disoriented. Never operate your log splitter while under the influence of any drinks or medications. Always be sure you have a clear mental focus and a sharp sense of awareness when using machinery. 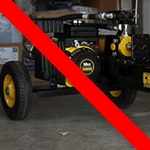 As with any other kind of power equipment, don't use gas-powered machinery indoors. The fumes produced by a gas-powered engine contain carbon monoxide. 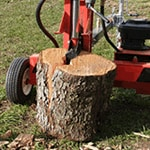 Running a gas-powered log splitter inside your garage or shed is the same as running a car inside. The poisonous fumes are odorless and deadly. If it's the weather that's got you looking indoors, consider an electric log splitter. For more on this topic, visit our article "Chilly Splits" to learn how to split wood in the winter. You may be half-way into a cut when you notice an adjustment you forgot to make prior to starting. Never make adjustments while operating the splitter. You could find your hand in the wrong place at the wrong time, or you might also damage the machine. Turn off the splitter, and make your adjustment before restarting. The log isn't going anywhere, so you'll be able to finish where you left off. Like we said at the beginning of this article, it's not wise to operate a log splitter behind your back while blindfolded. Likewise, it's not smart to operate in the dark. If you're working outdoors, and you got a late start, don't keep going when the sun descends below the horizon. Either light your work station with lamps or wait until the morning. There's never a need to dangerously hurry through splitting wood. Often times, it could use a little more aging anyway. So take your time, pay attention, keep the kids away, wear protective safety gear, don't operate under the influence, don't overwork your back, stop when adjusting, clear your area, and read the instructions. Most of all, enjoy your new tool. It's a whole lot better than chopping wood with an ax, and a whole lot safer too if you put safety first. While this is a general guide to help you split wood safely, Log Splitters Direct recommends that you always read and follow the instructions included with your log splitter to ensure your safety. 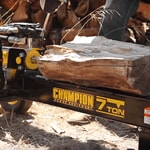 Log Splitter Safety.. Our Power Equipment Direct how-to library can help you learn about Understanding the Janka Scale, Proposition 65 Product Labeling and Sales Tax Information.